The programme of our conference on Secularities - Patterns of Distinction, Paths of Differentiation (04-06 October 2018), is now online. Listeners will have to register until 23 September 2018, please send an email to multiple-secularities@uni-leipzig.de and use the subject CONFERENCE '18. and which working group you want to join on Saturday. The opening keynote of the conference will be held by José Casanova on Early Modern Jesuit Intercultural Encounters and the Globalization of Secularities (4 October, 6:30 p.m., Paulinum). 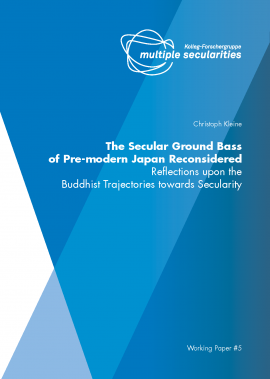 Christoph Kleine's working paper (#5) on The Secular Ground Bass of Pre-modern Japan Reconsidered. Reflections upon the Buddhist Trajectories towards Secularity, in which he aims to identify the epistemes, and historical à prioris that prepared the Japanese for the acceptance of Western concepts of secularity and shaped the specific way in which they appropriated these concepts, is now online. Katja Triplett has published an article titled Approaching Emptiness: Buddhist Pilgrimage in Japan in Approaching the Sacred: Pilgrimage in Historical and Intercultural Perspective. Edited by Ute Luig, 59–89. Berlin: Edition Topoi, 2018. The KFG "Multiple Secularities" strongly supports the statement of the Rector's Conference of the Saxonian Universities against the recent outbursts of right wing radicalism and its political downplay in Saxony.